‘Tis the season for pumpkins, goblins, corn mazes and (apparently) pumpkin-spiced lattes. Whether your 4-H Club is in a rural area or in town or city, these long-honored traditions can be a part of your October. Even corn mazes are near many towns. Speaking of corn well before mazes became popular, the Otwell corn-growing competition garnered great publicity in Illinois in 1905. But the parade! What a spectacle! The Health H was the last to be added to the four-leaf clover symbol. But you can build many educational activities around that important part of 4-H education. 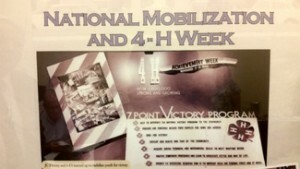 Do you have more ideas of how to celebrate the Health H in your programs? Surely you’ve heard of “Mulligan Stew,” and maybe you participated in it. Can you recall what year it premiered as a 4-H educational series? Who is Chris Clover? Rumor has it that he or she is a long-honored spokesperson for 4-H around the country. Tell us whether he or she has shown up in your county yet. We again feature one of the several people who “made 4-H great;” this one is credited with starting a hot lunch program in schools, pretty significant in 1907! We’re pushing the “Map Your 4-H History” this year at NAE4-HA. Think of historic sites in your area that you want to be documented on the internet-based, publicly-accessible atlas of 4-H History. Easy to do, and your site will be recorded forever. Haven’t got your Halloween costume ready yet? How about going as Chris Clover! If not, stay home and take pictures of the Trick-R-Treaters while you sip your pumpkin-spiced latte and enjoy this issue. 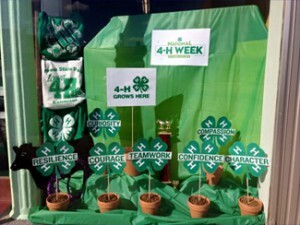 A local store window display for National 4-H week in 1942 resembled one we saw on Twitter this year in that both referred to the growing of 4-H. The 1942 version was “4-H, Strong and Growing” whereas 2015 is more individually oriented with “4-H Grows Teamwork, Curiosity, Resilience, Courage and so much more! Produced in 1972 and released in 1973, “Mulligan Stew” was not the first 4-H TV series, but it stimulated an extraordinary increase in 4-H enrollment at the time. The series of six half-hour programs centered on a kids’ rock band that “turns on” to good nutrition by – a la “Mission Impossible” – solving a different type of nutrition problem in each episode. It was developed and produced by Extension Service/USDA, and filmed by USDA Motion Picture Service, based on work by Developmental Committees and Iowa State University Extension Service 4-H Nutrition Television Programs, with a grant from the Expanded Food and Nutrition Education Program (EFNEP). Member project book for television viewers. Eleanor L. Wilson, national 4-H TV coordinator at the time, recalls that the 4-H TV Developmental Committee liked what Iowa State did with nutrition content, but the series did not emerge as a creative whole until Ira Klugerman was hired to direct the show. Klugerman, with a background of children’s television at WQED in Pittsburgh, came up with the title and general treatment. Production began on location in Washington, DC in 1971. Besides budget concerns which Wilson managed, nutrition content had to meet existing standards. Sue Kleen Benedetti, Home Economics Information Specialist at the time, was named along with Wilson as Technical Director to assure that everything was nutritionally correct. Benedetti chose, prepared and staged food for the home scenes. The child actors were sometimes difficult and Wilson recalled that when she was not juggling budgets, she was settling arguments on the set or haunting local produce markets looking for just the right shade of green vegetables for the next day’s shooting. “Mulligan Stew” premiered October 4, 1972, during National 4-H Week at the National 4-H Center, but it was already a winner. Advance information had enticed the states and they were lining up their viewing schedules and stockpiling materials. The series included the six half-hour films, leaders’ guides, and a “Mulligan Stew” comic-book developed by Michigan State University. 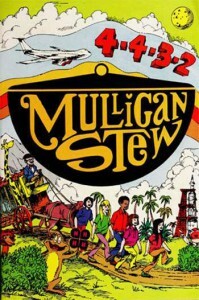 “Mulligan Stew” was promoted and distributed through the National 4-H Service Committee, and Television Specialist Larry L. Krug recalls the comic-book printer’s reaction: “We placed an initial order for one million copies of the comic book and before they got them off the presses I had to call back and order another one and a half million. They thought I was crazy. Before the series was completed we had printed over seven million copies of the ‘Mulligan Stew’ comic-book.” Cooperative Extension Service invested $716,000 in “Mulligan Stew,” or about $1 per child enrolled, compared to the $10.48 cost of enrolling a child in a single 4-H project at that time. A 4-H member from McConnelsville, Ohio, summed up the series’ appeal when he wrote, “Dear Mulligan Stew, Thank You for putting on the show. It taught me a lot about nutrition. My little brother watched it and is eating better now. I hope you will show it again next year. It was funny too.” From letters like that it was apparent that the series had succeeded in promoting concepts of good nutrition in an educational – yet fun – way, and the series very significantly increased 4-H enrollment at the time. Most Washingtonians (DC types) leave town in August because of the heat, but your 4-H History Team is still here! What activity expanded 4-H enrollment to over seven million in the 1970s? Want an easier question? OK, what put 4-H in the Comic Book business? Same answer. We start a new 10-month series featuring “People Who Helped Make 4-H Great!” Reprints from 1962 National 4-H News highlight the significant contributions of individuals whose leadership formed and strengthened the program. “Hands-on History” this month is about entrepreneurship activities your club can take on. Make money for an important goal just like 4-H clubs have done for decades. The 1904 Louisiana Purchase Exhibition (sometimes known as the 1904 World’s Fair) was the site of a significant 4-H exhibit. What would Illinois 4-H want to show the world? 4-H’ers from seven states recently unveiled their National 4-H History Map to 16,000 cartographers from 120 countries. Have you decided which people, places or events you want to memorialize on the 4-H History Map? The sweltering heat is not a deterrent; 4-H continues to build and honor its history! Enjoy this issue.